Noble gases market received a tremendous boost on account of rising applications in niche markets, such as laser technologies, window insulations, electronics, semiconductors industry, and energy-efficient lighting industry. These gases have found industrial acceptance in various sectors such as, oil & gas, chemical, mining, power, energy efficient buildings, surgery, semi-conductors, aerospace, steel and aluminum industries, among others. Since noble gases are inert in nature and do not react with other elements, demand has increased in applications, where oxidation or other reactions are required. 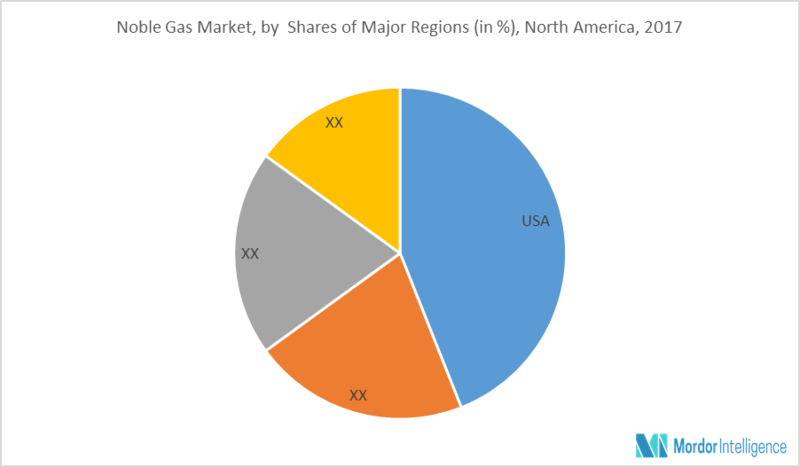 The North America noble gas business is at developing stage, however, it is expected to grow steadily over the forecast years. January 2018: Toyota announced that the company is introducing its first hydrogen fuel cell vehicle into Canada's most active electric vehicle market, later this year, a move that could eventually help eliminate emissions from automobile use in Canada. January 2018: Air Products expects to commission an ASU (Air Separation unit) in New Johnsonville, Tennessee in the third quarter of 2018, under a contract to supply the American chemical corporation, Chemours Company FC LLC, with tonnage quantities of oxygen, nitrogen, and argon. January 2018: Air Products will unveil a new world-scale steam methane reformer (SMR) and cold box in Baytown, Texas in 2018, to produce hydrogen and carbon monoxide (CO) to be supplied to customers from Air Products’ Gulf Coast Hydrogen and CO Pipeline Networks. Major Players: Linde, Air Products, American Gas, Proton Gases, and Praxair, amongst others.